It is for the enterprise that wants WU to be its primary update source while Windows Server Update Services (WSUS) provides all other content. In this scenario, the WU client automatically scans against both WSUS and WU, but it only accepts scan results for Windows content from WU. Stated another way, anything on WSUS that resides in the “Windows” product family is ignored by the Dual Scan client. This is to avoid the “two masters” problem that can occur when there are multiple equally valid sources of truth for a given set of updates. In my particular case I have ‘Configure Automatic Updates’ and ‘Specify intranet Microsoft update service location’ enabled. These are the two standard/typical policies that any organization will have enabled if they are using a WSUS instead of Windows Update or Microsoft Update. Additionally, I also have the ‘Defer feature updates’ setting enabled on my Windows 10 computers. 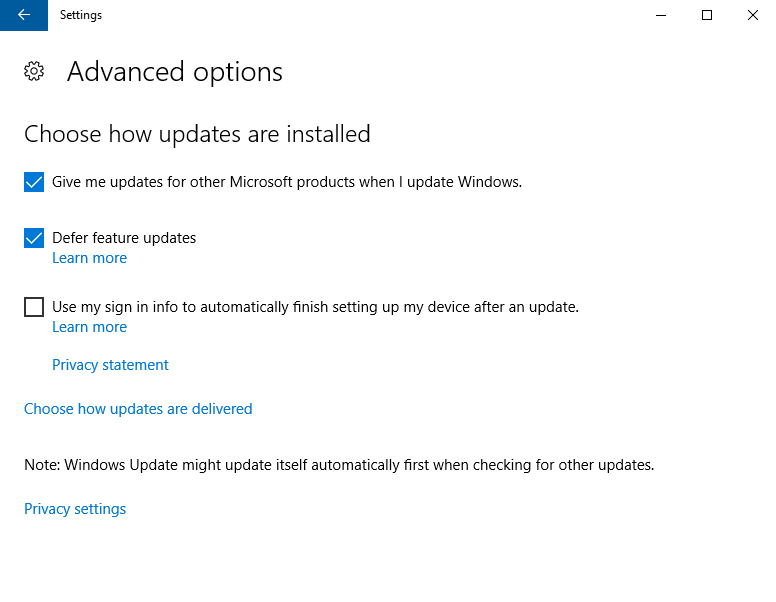 This setting is visible in the ‘Advanced options’ for Window Update Settings control panel, and it’s similar to the group policy ‘Select when Feature Updates are received’ mentioned above. 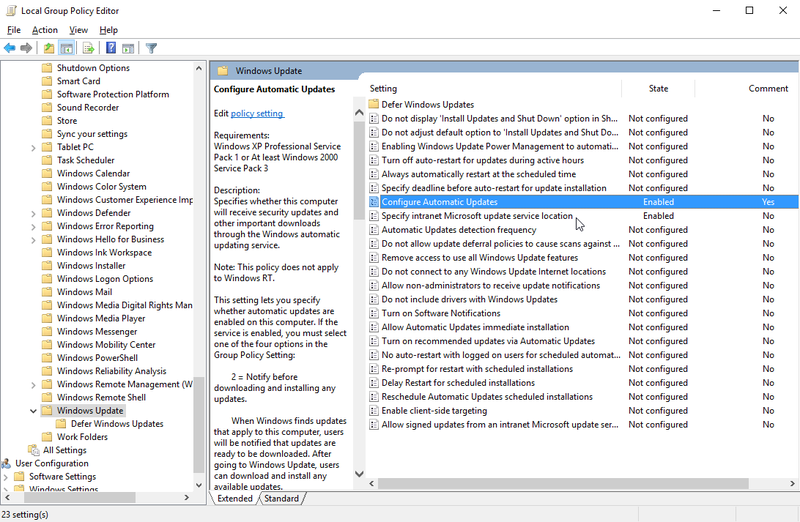 The behavior that resulted from having the combination of policies described above enabled on my computer is that all of a sudden my scans for Windows Updates were being performed on Microsoft’s public Windows Update server instead of my internal managed WSUS server. Frankly, I was absolutely *shocked* at this change in behavior. We believe that this behavior should not have been automatically enabled by Microsoft but rather should only have been enabled if/when the administrator turned on this capability. However, we obviously have no control over Microsoft, which means that now we instead must just focus on understanding how to effectively disable this behavior. IMPORTANT: In late 2017 Microsoft actually removed the UI option checkbox for ‘Defer feature updates’ but it is still possible for the underlying registry entry that controls the actual behavior in Windows to be enabled. In fact, if you had the ‘Defer feature updates’ box checked in the past, then you will likely encounter this very same situation where the UI checkbox disappears even though the underlying registry value is still configured/enabled. This means that you could unknowingly have ‘Dual Scan’ enabled even if you think your settings are all correct. I encountered this issue on my 1607 test computer, and I had to manually alter the registry value since the UI option was removed. The ‘DeferUpgrade’ registry value must be either set to 0 or deleted altogether. If you delete it, make sure to only delete the ‘DeferUpgrade’ value. Do not delete the entire registry key path. Additionally, make sure that the aforementioned registry value for ‘DeferUpgrade’ is not set to 1. You may either set it to 0 or delete the value altogether. If you don’t see this policy in your list of available policies in the Group Policy console then you most likely just need to apply the latest cumulative update for your OS, after which you should see the option. For version 1607 it arrived in August 2017, while for version 1703 it arrived in October 2017. Error -102: Failed to execute the search. HRESULT: -2145124306 in BatchPatch. Error -102: Failed to execute the search. HRESULT: -2145103860 in BatchPatch. This entry was posted in Blog, General, Tutorials and tagged dual scan, Windows Updates, WSUS. Bookmark the permalink. Both comments and trackbacks are currently closed.